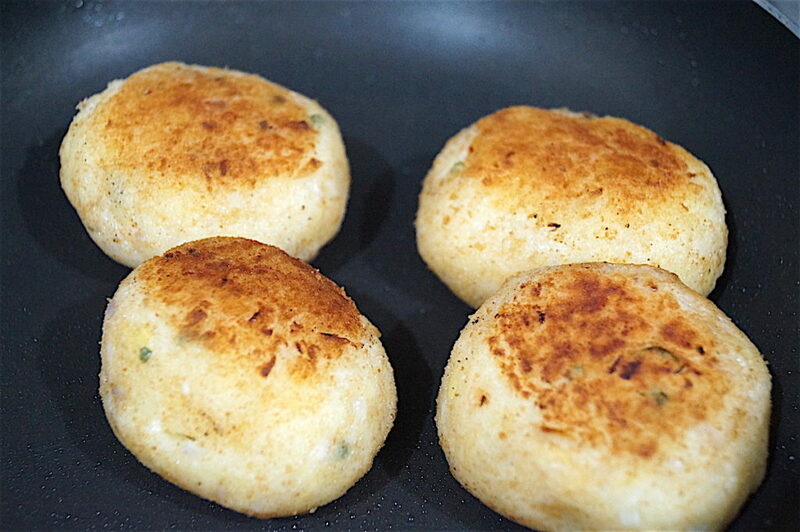 One forgets about the simple dishes like egg chops, so easy and delicious. It’s been literally decades since I’ve eaten them and last month on a trip back home with my family, my mom mentioned egg chops for dinner and it kind of rang a bell in my head. We made the simple ones back there, just covering the egg halves with a potato mixture, which was delicious and I would eat no less than four of them in one sitting. That gave me an idea though. How about we go for a slightly more fancy stuffing inside. 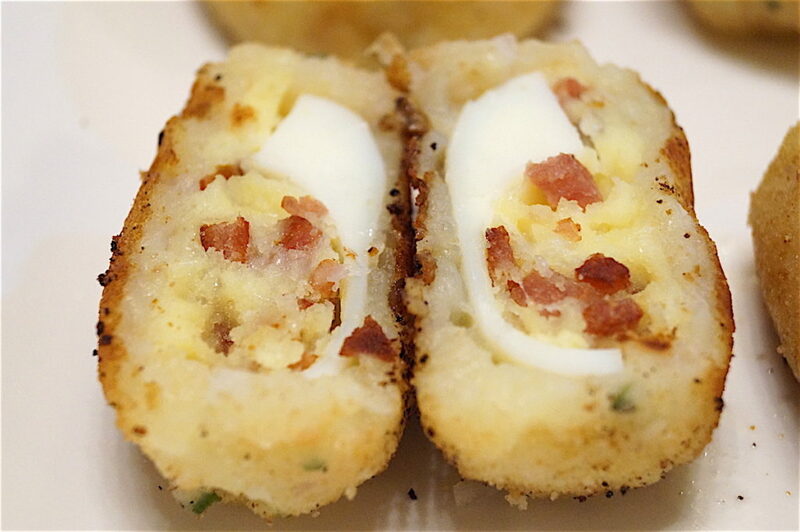 So I removed the yolks from the halves, mixed them with finely chopped mozzarella cheese (you can even use cheddar or actually any cheese of your choice) and finely diced cubes of ham and stuffed them back into the whites and then coated them in a potato mixture and then breadcrumbs. 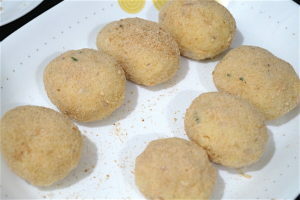 These are shallow fried in very little oil but one can also deep fry them. The chops came out yum and found great favour especially with the carnivorous husband and son, because well, ham and cheese are a pleasing combination anywhere right? And the two of them sharing the same lack of regard for vegetables and healthy food will always go for the higher calorie, cheesy, meaty options instead of the simpler but healthier ones! If you want a cheesier and gooier filling then you can toss out the yolks and just stuff the whites with cheese and ham but that’s quite a waste of yolks to consider. You can have these egg chops for dinner and pair them with simple stir fried vegetables or also this vegetable medley or a salad. Makes for a nice and fulfilling nutritious meal. The chops come out light and soft and are an absolute treat. One thing to mind, if your eggs are small eggs, use medium sized potatoes, if the eggs are large eggs, use larger sized potatoes. Mash the potatoes and add the onion, green chilly, garlic and salt and mix well. 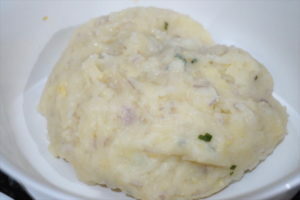 Keep the potato mash in the refrigerator for an hour or so to make it harden up a bit. Slice the eggs in half lengthwise. Remove the yolks from the whites and put them in a separate bowl. Mix the cheese and the ham with the yolks and stuff them into the yolk cavity of each egg white section and even covering the whole surface of the egg if there’s enough cheese mix. Divide the mashed potato mixture into 8 portions. 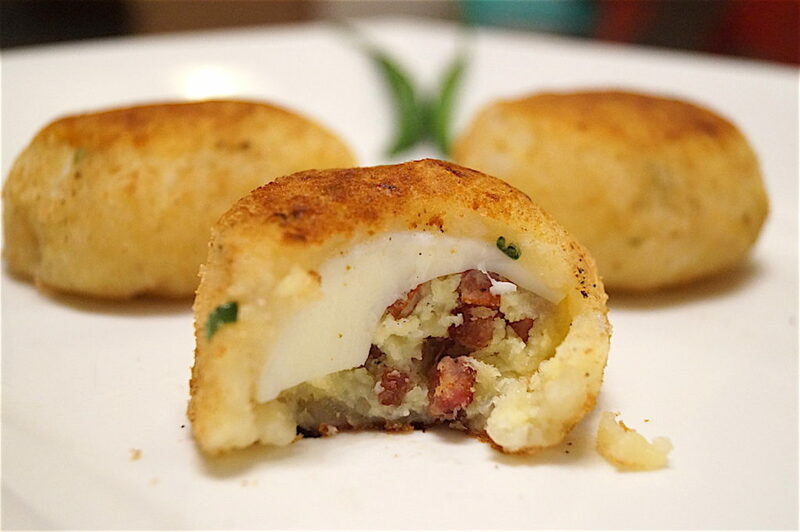 Take a portion, flatten it on your palm, place the stuffed egg-half upside down on the potato mix and wrap it all around the egg. 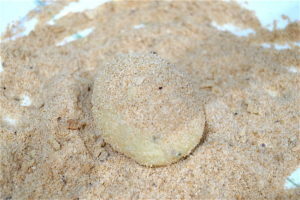 Then coat the egg roll with breadcrumbs. Repeat with all the other portions. Heat 3 tablespoons of oil in a large non-stick pan on medium to low heat and place the egg chops in the pan. Make sure the breadcrumbs stick nicely to the chops and there is as little excess crumbs scattered in the oil else they tend to burn and blacken the chops. Turn the chops as one side gets browned. Once the chops are evenly browned (not too much though) on both sides, remove them onto a serving dish and eat immediately. 1. Add the onions, garlic salt and chillies to the mashed potato and mix well. 2. Finely dice a slice of ham. 3. 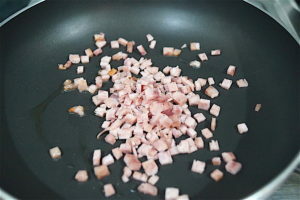 Roast the ham in a non-stick pan in half tsp of oil till slightly crisp. 4. 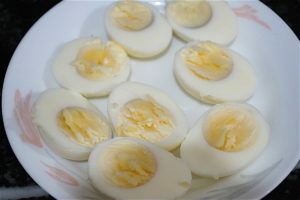 Cut boiled eggs in half and scoop out yolks. 5. 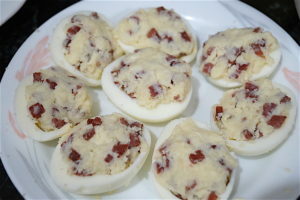 Add the ham to the scooped egg yolks and cheese and stuff into the egg whites. 6. 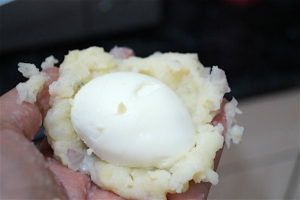 Flatten a ball of potato mash, place the stuffed egg-half side onto the mash and wrap around the whole egg making sure to leave no gaps. 7. Coat the chops in breadcrumbs. 8. Till they look like this. 9. 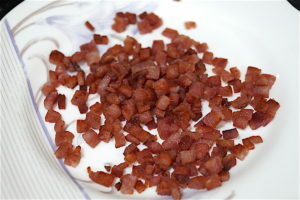 Fry in two batches in 3 tbsp of oil each till golden brown on both sides.